Like looking young? Or trying new skincare products? Or just free stuff? This could be your lucky day! Now through August 23, you can enter for a chance to win an age-defying prize pack valued at over $250. It is super simple to “get your name in the hat”…like us or write a review on Facebook, share my blog or tweet about this gorgeous giveaway. Easy breezy. Click here a Rafflecopter giveaway. Connect with us for a chance to win over $250 worth of anti-aging skincare! This package of goodies contains all things ageless. 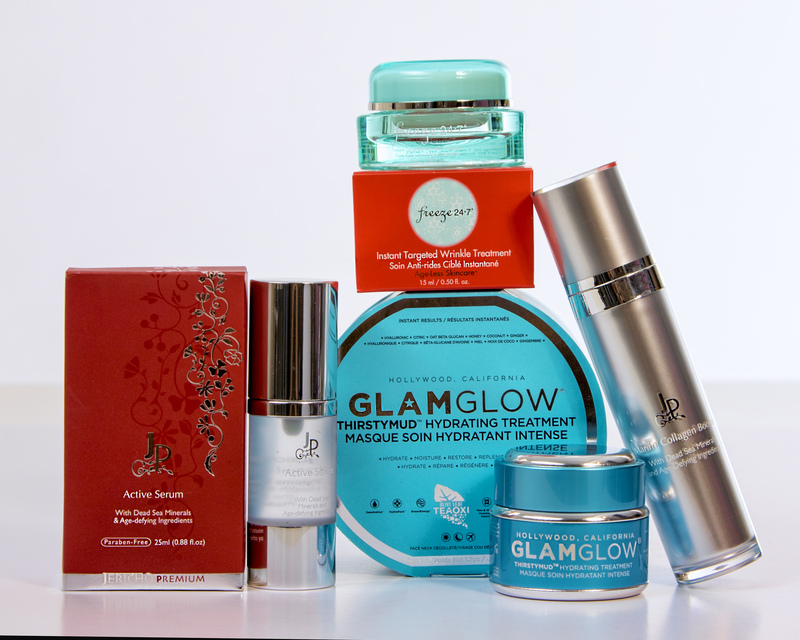 There are 4 full-size anti-aging products including Jericho Premium Active Serum and Marine Collagen Booster, GLAMGLOW ThirstyMud Hydrating Treatment and Freeze 24/7 Instant Targeted Wrinkle Treatment. All are terrific, results-driven brands that will make your skin glow. And, they can be used in combination with one another. The Jericho Premium Active Serum and Marine Collagen Booster are made with Dead Sea minerals and plant extracts. They are all natural and feel so good! The serum lifts, while the collagen booster tightens and tones. GLAMGLOW ThirstyMud Hydrating Treatment is like a facial you’d get at a spa. It gives a mega dose of hydration for a youthful and dewy look. Freeze 24/7 Instant Targeted Wrinkle Treatment is nothing short of perfection. It instantly, and I do mean instantly, diminishes fine lines and wrinkles all over the face – from the forehead to lips and everywhere in between. Connect with us…tell your friends…enter for a chance to win this amazing collection of age-defying skincare…today! This entry was posted in age defying, anti-aging skincare, giveaway and tagged anti-aging, enter to win, free product, giveaway, raffle. Bookmark the permalink.